A double CD set with one CD consisting of songs and the other featuring instrumental music. 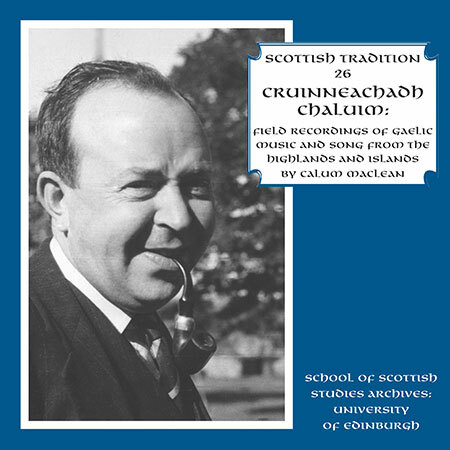 Calum MacLean (Calum an Tàilleir) was born in Oskaig, Isle of Raasay in 1915, and was educated locally before entering the University of Edinburgh, gaining a first class degree in Celtic in 1939. His further studies took him to Ireland where in due course his work as a collector began. MacLean worked assiduously collecting nineteen bound volumes of transcribed lore and a further five full bound volumes of his diaries. In 1951 MacLean began to formally work at the newly founded School of Scottish Studies in Edinburgh as their first appointed collector. He was the first person to undertake the full-time systematic collecting of Gaelic songs, stories and traditions in the Highlands and Islands. Everywhere he went he found the best contacts and tradition bearers and gathered in a vast amount of oral material straight from people’s memories. In 1956 MacLean was diagnosed with cancer and in 1960, at the age of forty-four, his life and work were tragically cut short. This double CD set arises from a major project at Celtic and Scottish Studies, University of Edinburgh, funded by the AHRC, and undertaken by a project team comprising Dr John Shaw (Principal Investigator), Dr Andrew Wiseman (Researcher) and Naomi Harvey (Researcher). The project was based on material held in the National Folklore Collection, University College Dublin, and in the School of Scottish Studies Archives, University of Edinburgh. CD1 comprises a wide range of singers and songs from the Highlands and Islands of Scotland, while CD2 consists of instrumental music, equally diverse and also from the Highlands and Islands, all collected by Calum MacLean. This is a remarkable and unique Scottish Tradition Series collection, adding even more depth to the Series. The album was mastered by Peter Haigh of Pier House Studios and the design is by John Slavin of Designfolk.